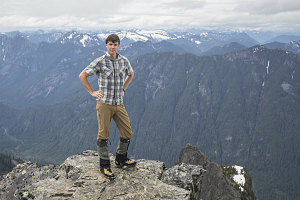 After the soggy and ultimately unsuccesful second attempt to climb Glacier Peak, climbing partner Rosty had to go back to work. The forecast for the day was pretty decent, and I really didn't want to waste any opportunity to do something - while remaining DRY - on my trip to the northwest. Rosty graciously offered me the keys to his trusty 4-Runner, and I picked a moderate objective that I could solo in a day from downtown Seattle. I picked something along interstate-90 at Snoqualmie Pass - in fact, I chose a peak of the same name: Snoqualmie Mountain. 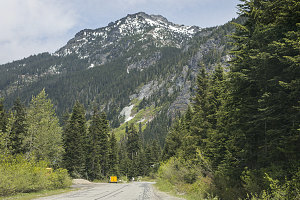 Snoqualmie Mountain is a moderate (for this area), a 6300-foot broad-shouldered mountain very close to the pass on I-90. 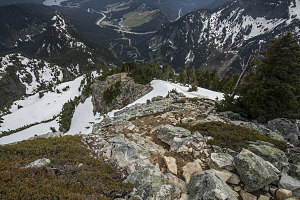 There's a well-defined climber's path leading up its south slope / ridge (called the Alpental Slope trail), and the distance is short (2.7km one way). Elevation gain was robust enough, at roughly 3200-feet of gain. Overall it was an objective that could be easily achieved on a day outing. 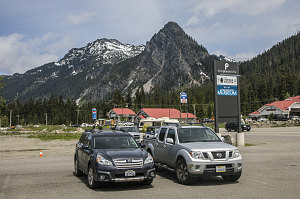 I took me less than two hours to drive from Rosty's downtown Seattle neighborhood to Snoqualmie Pass. 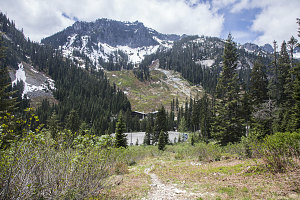 While having a lunch sandwich at The CommonWealth (an establishment at Snoqualmie Pass), I scouted out the route, both from my guidebook and from the clear view I had of it from my seat. 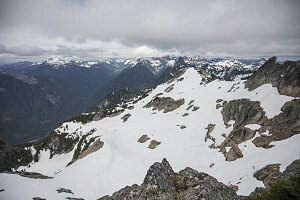 Like Glacier Peak, I could see there was a fair bit of snow at relatively low elevations for this time of year, and I definitely was going to bring my ice ax. 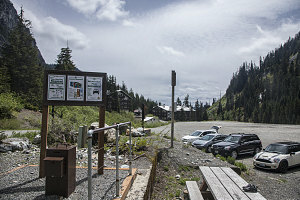 A five minute drive along short bit of paved forest service / ski resort road (teutonically called the Erste Strasse) to the also-teutonically-named Alpental parking lot was all it took to get to the trailhead. 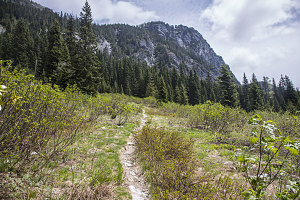 The forest service trailhead here is actually for Snow Lake, but if one looked closely a few yards to the right, a fainter but still well-defined path led more directly up towards Snoqualmie. 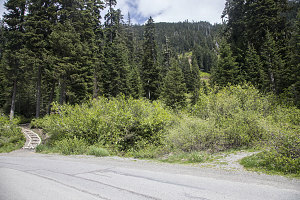 This was the start of the Alpental Slope climbing path. The first little bit of path was along an easy grade and through a bit of open meadow. Things got less nice shortly thereafter, however, as the path started following a rocky, eroded streambed - not unlike the tedious stuff one encounters on trails in the northeastern US. Couldn't complain too much, though - after all, this was not an official trail. 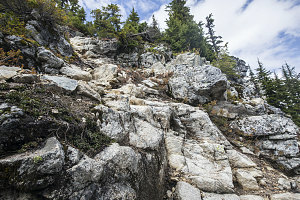 The grade steepened and the trail roughness varied from bouldery to reasonabl as elevation was quickly gained. There weren't too many switchbacks on this path. 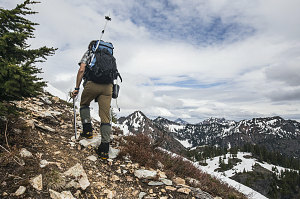 At about 4100 feet I started to encounter the first significant patches of snow, and with that, routefinding requirements kicked in and slowed me down. 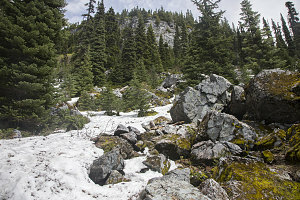 It was not super obvious where the faint footpath led, but after a bit of back and forth discovered that staying to the left edge of a bouldery meadow and to the right of a steep creek was the ticket. At the top of the bouldery meadow a clearer and more snow-free path led across to a crossing of the steep creek, right at a point where there were two very nice high waterfalls - one above and one below the crossing. This was the first real good lookout on the climb. 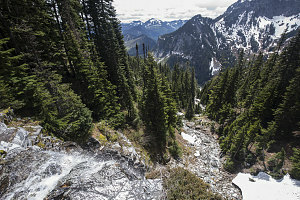 Above the waterfall(s), the path once again resumed a steep ascent up through mature fir forest. The snow cover here was continuous, the snow was fairly hard, and the slope very steep. I got out my ice ax because there was no way I was going to be able to stop myself before hitting big tree trunks if I slipped. The trail, fully under the snow, was now pretty much impossible to follow. I could see some faint footsteps kicked in the snow and followed those as best I could. 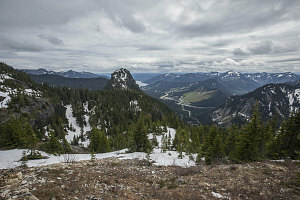 Using my GPS' topo display to angle towards the start of Snoqualmie Mtn's southern ridgeline brought me to the second open / lookout area and a re-acquiration of the path. 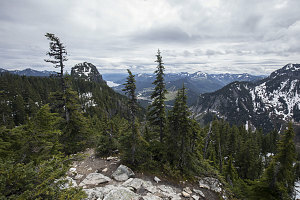 Nice views were opening up in all directions - down to Snoqualmie Pass, over to Cave Ridge, and some of the more distant terrain. The weather wasn't totally clear, but it was high haze and sort of sunny. Not bad at all, and I certainly wasn't complaining (after the last few days). 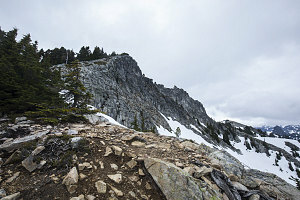 Now on the crest of the south ridgeline, the navigation was easy - head straight up along the crest. 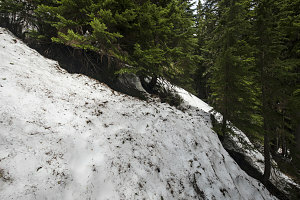 The grade increased again, varying between moderately steep snow and sections of dry talus and a spot of trees here and there. Where the snow wasn't, the climbing path was obvious. 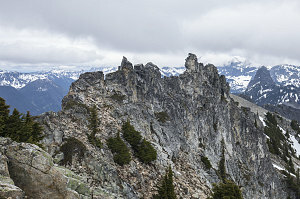 The summit soon came into view at the end of the ridgeline above. On its left it was suprisingly treed, and on the right dropped steeply away into a large northeast facing bowl (which itself was filled with lots of late-season snow). 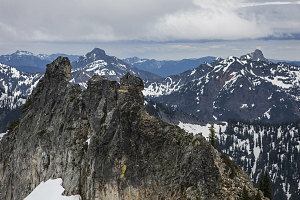 Also visible on the crest was the jagged ridgeline leading eastward towards Lundin Peak. 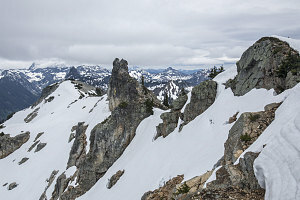 I was contemplating scrambling along that ridgeline to do a loop hike variant of the climb, but now that I looked at it, it seemed a bit much for me to do solo. 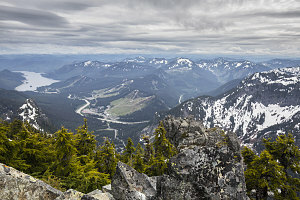 The summit was achieved shortly before 3pm, only about one hour and 45 minutes after starting out. 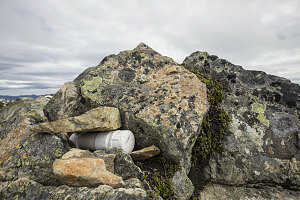 Without the routefinding challenges and a slight bump in pace, it would easily be possible to get from parking lot to summit in 90 minutes. 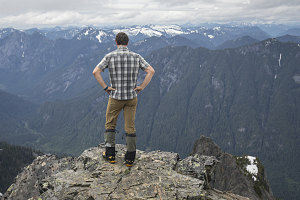 Being alone, I took some time to take some selfies and take in the views of the surrounding Cascades. 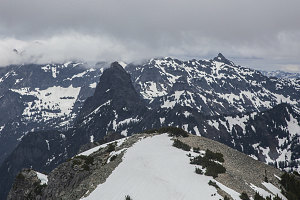 The cloud deck was high enough that only the highest, more distant peaks were obscured. None of those pesky volcanoes were visible from here today, unfortunately. After spending a good twenty minutes on the summit, I decided it was time to head back down. 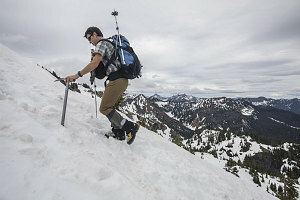 With no routefinding to do and with snow quite suitable for heel-plunging, it took no time at all to descend the upper mountain. 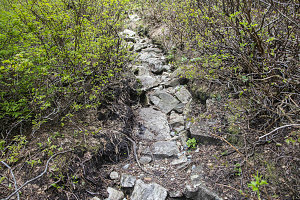 The lower parts of the climbing path required a bit more care (e.g. 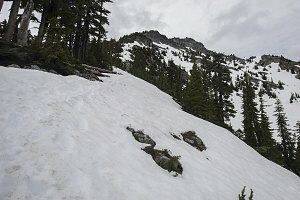 the hard steep snow in the forest, and the bouldery stuff near the start), but still it took less than 90 minutes to descend.